Guest blog post by Marco Häberle who recently graduated from Kopenhagen University in 2018 with an MA in Disaster Management. The post below is based on the findings of his MA thesis. Over the last years Unmanned Aerial Vehicles (UAVs) or drones had been already used for mapping and monitoring of areas affected by sudden-onset disasters. Rapid Mapping is an approach to get mapping data very quickly in the immediate aftermath of disasters. This data can be crucial of importance for disaster managers in the field because there is an enormous lack of information in the early phases of disasters. For producing information in disasters there is an already established systematic workflow in the humanitarian sphere which is shown in the graphic below. Obliviously this workflow persists of time-consuming processes and depends on a lot of humanitarian efforts. UAVs have the potential to create information as well and hence support humanitarian efforts. Unfortunately, UAVs had not been effectively used yet in a systematic “rapid mapping” approach for disasters. This huge gap opened up the way for a study carrying out a gap analysis for rapid mapping in sudden-onset disasters. Looking now at past experiences, what have the underlying problems been for getting UAV mapping and delivery of geospatial data done in a fast manner? What is needed to achieve this rapid mapping approach immediately after a disaster? By tackling these issues for rapid mapping, information-gathering and decision-making on the ground could be accelerated. The research focused on a gap analysis of the existing humanitarian procedures behind “rapid mapping” and “information dissemination”. More specifically, humanitarian structures and processes were explored and a rapid mapping workflow was designed to identify key challenges. This qualitative study is based on four semi-structured, open-ended in-depth-interviews with key informants from humanitarian organizations with disaster experience up to 20 years from the field. In the complex and diverse field of disaster management there are plenty of actors which are involved in mapping, UAVs and information dissemination. To get a better idea this stakeholder map below shows the main four parties with its actors which were mentioned in the interviews. Along with these actors there also are plenty of processes and tasks which have to be fulfilled for rapid mapping. 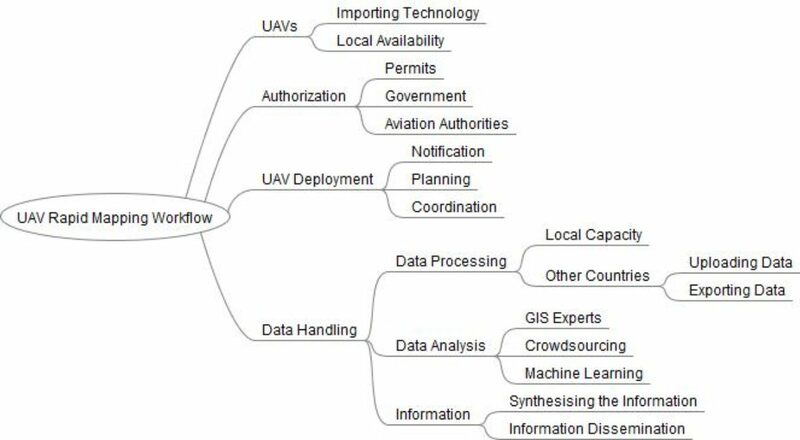 These were summarized in the graphic “UAV Rapid Mapping Workflow” below and consist mainly of the four stages UAVs, Authorization, Deployment and Data handling. If there is one stage which takes extremely long, rapid mapping turns into slow mapping. The interviews clearly exposed challenges for UAV authorization, UAV coordination and data handling in the field. These challenges result in delays and slow down mapping efforts. Furthermore, several issues in the humanitarian sphere can create friction and delays. Disagreement, disintegration and disconnection of actors and a literacy gap on geospatial science are the most notable observations. And lastly, disaster specific issues vary from one disaster to the other disaster and can delay rapid mapping efforts as well. For example, an unstable internet connection would simply delay the upload of data. These quotes are some of the most outstanding quotes given by the interviewees which give a better impression of the challenges around rapid mapping. Clear licensing, agreements with governments in a partnership framework need to be in place. Prefabricated coordination mechanisms have to exist for not only being effective but regarding safety issues as well. Clear structures and processes for data handling have to be prepared for, especially looking at new methods for data analysis. Preparedness means having all these structures and processes set up before disasters hit to not waste any time in case of emergency. Stronger cooperation within actors and establishing best practices could accelerate mapping efforts as well. Implementing UAVs into the humanitarian cluster system as an own sector with standardized procedures could be a logical conclusion and a way-forward. Author bio: Marco Häberle graduated from Kopenhagen University in 2018 and successfully completed his academic Master degree in disaster management. Within the master programm he participated in the UNITAR training course “Geo-Information in Disaster Situations” in Geneva, the humanitarian congress in Berlin and the UAV drone days at Hans Christian Airport in Odense, Denmark. Besides he holds a Bachelor of Science degree in Geography with a specialization in meteorology and climatology from Albert-Ludwigs University of Freiburg, Germany. During his bachelor thesis he worked with drones as well by carrying out a parameter-based accuracy and quality assessment of aerial photography.